Hidden jewel and a giant at that….Beilschmeidia wightii in the Kukkal shola. It was first identified by Father K.M Matthew in the 1980s. Finding it in the vast Kukaal shola seemed like an impossible task but in April we managed to stumble across it perhaps more by accident than design. Botanists who describe the structural characteristics of sholas often emphasize their relatively low canopy height. Shola trees are known for their stunted, gnarled morphology that many species have as a result of their exposure to fierce winds in the upper altitudes of the Western Ghats. Most cloud forests do indeed have short canopy heights of 15 meters or so, as compared to the towering 50meter trees of lowlands tropical rainforests. However, there are exceptions and one of them was first noted by the esteemed botanist and plant taxonomist Father K.M. Matthew (1930-2004). Working out of the Angalade institute at Shembagagnur he was a prolific documenter and guardian of the sholas and other forests of southern India. He played a key role in the founding of the Palani Hills Conservation Council (PHCC) and was a major supporter and mentor to the Vattakanal Conservation Trust. This last April I accompanied Bob & Tanya of the VCT on an exploratory hike to find Beilschmeidia wightii in the Kukaal shola. This is a very large shola covering a large basin area on the western border with the Anaimalais Tiger Reserve – not quite the classic “patch shola” that you find in the upper reaches of the Western Ghats. I had doubts about finding a single individual but was keen to get out into the hills and forests. Kukaal shola is widely known for its enormous, blood-thirsty leeches. However, it was undergoing a rare and brief dry spell and we shed relatively little blood. Remembering directions from two decades earlier, Bob, Tanya and I meandered along wood-cutting paths and then climbed up a slope following one of the larger streams. The forest was fairly dense and populated with a variety of tree and shrub species that we are familiar with from the temple path. At some point I saw it from a distance and as we approached realized that this had to be Father Matthew’s tree. It was indeed very, very large and towered far above…perhaps 30 or 40 meters. In some ways it was similar to Bombay Shola’s “500 year old” Syzygium densiflorum, only its trunk was not half rotted out! The girth was large-it would have taken 4 or 5 of us to make a ring around it, though we need to return to make more exact measurements. For now, the idea that all shola trees are short has been definitively put to rest. We trust that somewhere Father Matthew is smiling down on Kukaal and the Palanis. 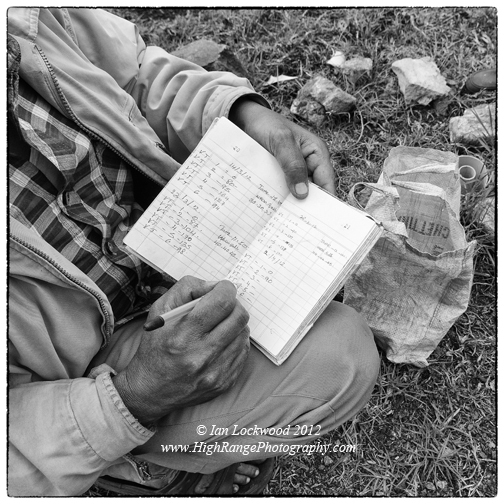 A veritable needle in the haystack? 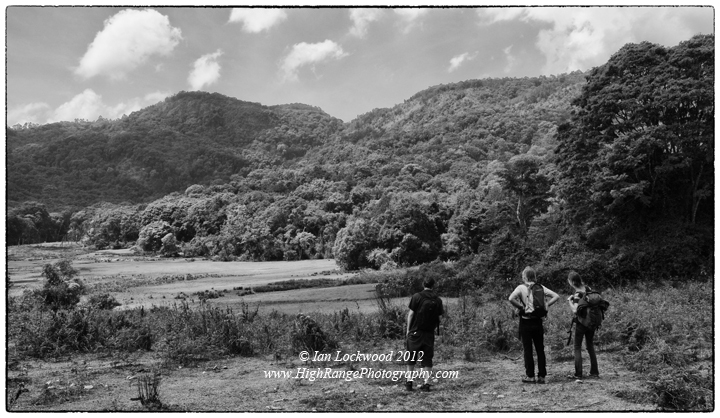 Looking over Kukaal shola as we get our bearings to look for the mystery tree. 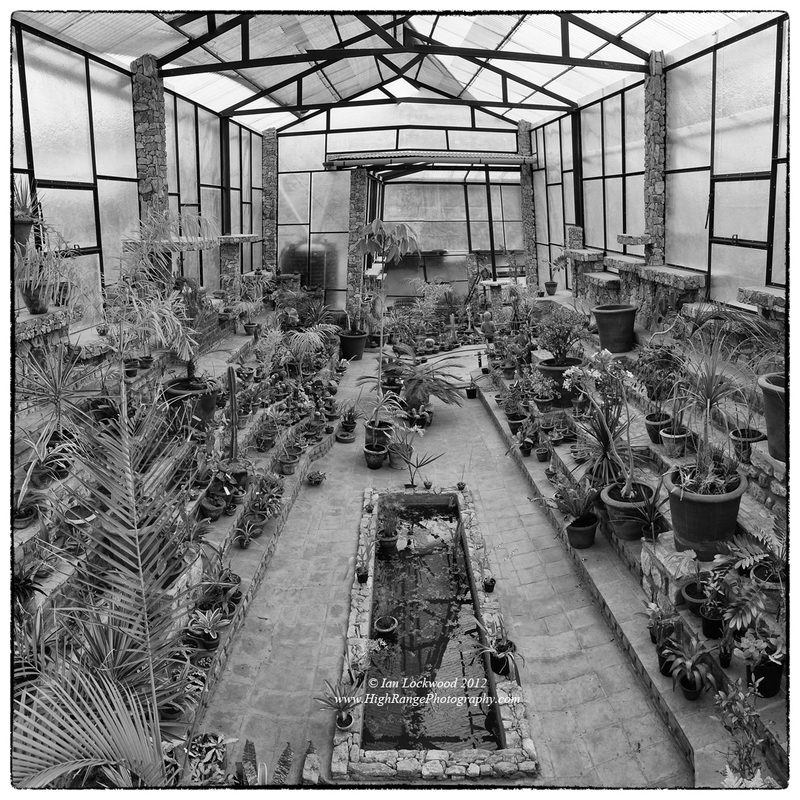 Vattakanal Conservation Trust’s greenhouse in Pambarpuram near the hill station of Kodaikanal. The structure houses a wide variety of plants from the Western Ghats. It is here at this location that native grasslands are being nurtured to be replanted in degraded habitats where VCT is working to restore montane grasslands. The Vattaparai marsh might be missed as just another boggy wetlands bypassed on the way to the grander sights of the Palani Hills. Generations of students and hikers from KIS have passed its small watershed on the short cut to the Berijam road. In spite of its inconspicuousness Vattaparai is the site (see map below) of a groundbreaking study of Western Ghats montane grasslands hydrology and ecological restoration. One of the major concerns about the loss of forests and native vegetation (including grasslands) in the Western Ghats due to aggressive afforestation programs is the dramatic impact on stream flow and hydrology. Healthy native forests in the mountains ensure a steady flow of water, a feature that is crucial in the leeward side of the Ghats where the eastern plains are arid and suffer from periodic drought. Evidence suggests that the introduction of fast-growing, non-native tree species has altered this flow of water. Plantations of trees such as Acacia mearnsii, Eucalyptus globulus and Pinus sp. provide wood but are also responsible for negatively affecting the water table. A study of two similar watersheds in the Nilgiri Hills adds credibility to this argument (see JS Samra’s 1998 paper). One of the strongest arguments for restoring native shola/grassland systems is to revive watersheds (an equally strong argument concerns the issue of biodiversity, something that I have addressed in other published work on this site). 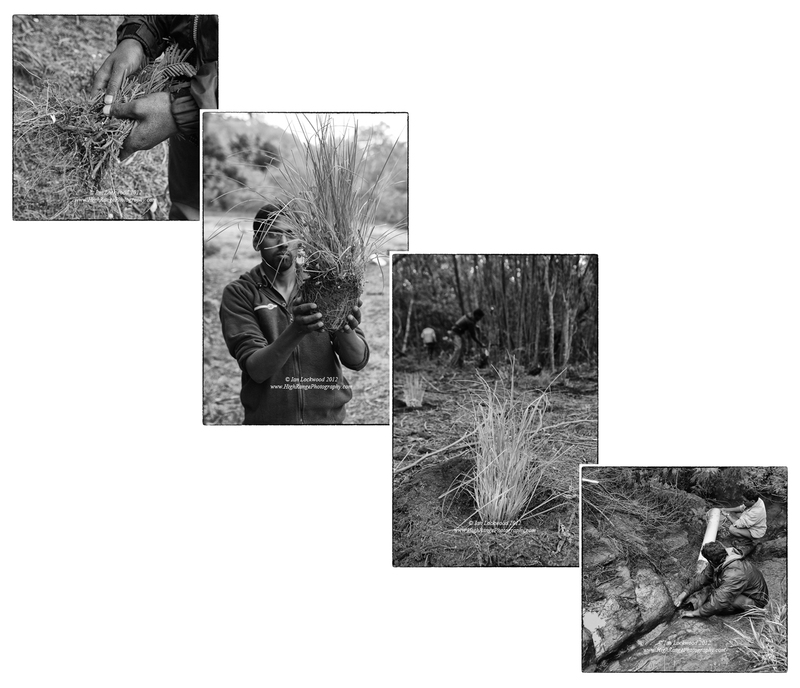 The Vattakanal Conservation Trust, which has a long track record in shola restoration, started focusing on grasslands species about 10 years ago when the 2006 Kurinji blooming was being anticipated. Up to this point there had not been significant research on reviving and restoring montane grasslands in the Western Ghats and the Vattaparai project has been a pioneering effort. In 2009 Australian hydrologist Michelle Donnelly collaborated with the Tamil Nadu Forest Department and VCT to set up a landmark hydrological study of Vattapari. The task was to find a disturbed grassland watershed, record its key parameters (rainfall, water table height, stream flow, plant species, extent of grasslands etc.) and then monitor these as the area was restored. Vattapari provided an excellent site and the Forest Department’s support of VCT initiative helped put the project into action. Michelle’s report (as a Google doc) on the project documents all aspects and data of the project. Water table monitoring wells and flow gauges were established in Vattaparai in 2009 and have been monitored since. In the meantime VCT with the support of the TN Forest Department and numerous volunteers has been working to restore the area around the marsh. This is a long-term study and it will take several years to see if the data supports the hypothesis that native grasslands provide a better watershed than non-native tree plantations. As might be expected there have been several challenges, notably in the gaur population that has trampled and broken tops of most of the ground water monitoring wells! Being herbivorous they also consume newly planted grass species before the plants can get established. In November 2010 a young male gaur was killed by Indian wild dogs (dhole) within view of a VCT team doing restoration work at Vattapari! The pictures here were taken in April on a foray out with VCT to check the ground water monitoring wells and flow gauges at Vattaparai. The results and data coming in from the site will form an import body of evidence to pursue further high latitude grasslands restoration projects in the Nilgiri Hills, High Ranges and Anaimalais. For a more detailed discussion on ecological restoration in montane shola/grasslands systems in the Palani Hills see my Sanctuary Asia (2006) and Frontline (2012) articles. The Vataparai marsh, located near to the Kodaikanal golf links, is an ideal location for ecological restoration. 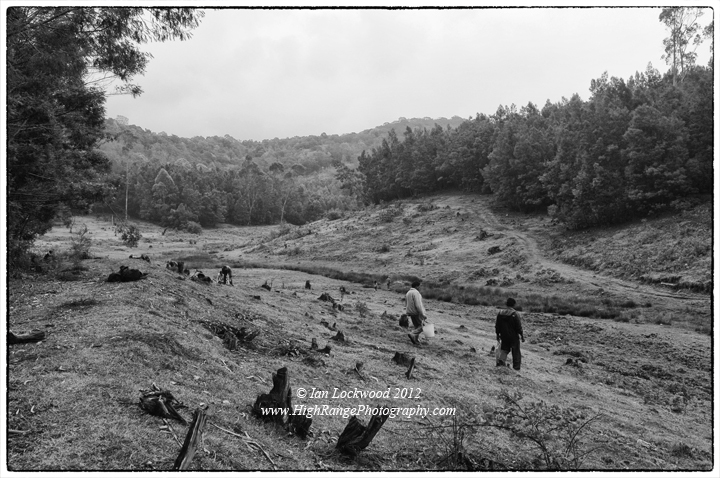 The surrounding hill slopes have been planted with Acacia, Eucalyptus and Pinus species while remnants of the native grasses still survive in the basin. The stream provides several points to monitor water flow on a weekly basis. The picture illustrates the edges which have now had their non-native trees cut back to allow grasses to be planted and spread on their own. Stages in grasslands restoration: pulling out wattle saplings, preparing a potted grass plant, newly planted grass plant with wattle removal in the background, monitoring steam flow using a crude but effective (volumetric) method. 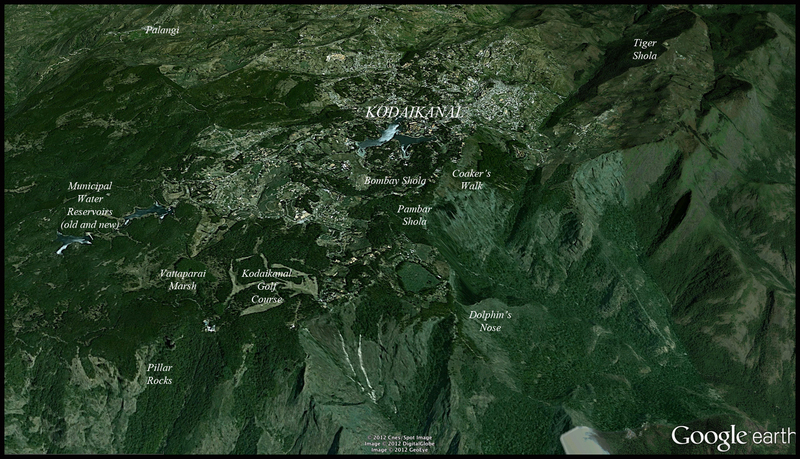 Google Earth image of the Vattaparai marsh and nearby points in Kodaikanal.